There are several elastographic methods which may potentially help to increase the diagnostic accuracy of ultrasound evaluation of breast lesions. 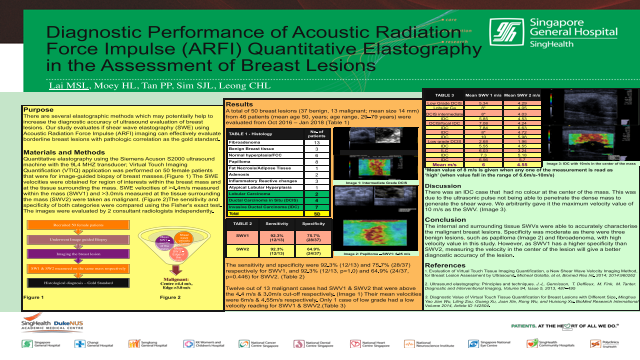 Our study evaluates if shear wave elastography (SWE) using acoustic radiation force impulse (ARFI) imaging can effectively evaluate borderline breast lesions with pathologic correlation as the gold standard. Quantitative elastography using the Virtual Touch Imaging Quantification (VTIQ) application was performed on female patients referred to the radiology department for image-guided biopsy of breast masses. The SWE velocities were obtained for region of interests within the breast mass and at the tissue surrounding the mass. SWE velocities of >4.4m/s measured within the mass (SWV1) and >3.0m/s measured at the tissue surrounding the mass (SWV2) were taken as malignant. The sensitivity and specificity of both categories were compared using the Fisher's exact test. A total of 50 breast lesions (37 benign, 13 malignant; mean size 14 mm) from 46 patients (mean age 50, years; age range, 29–79 years) were evaluated from Oct 2016 – Jan 2018. Twenty-six percent (13/50) were malignant and 74% were benign. The sensitivity and specificity were 92.3% (12/13) and 75.7% (28/37) respectively for SWV1, and 92.3% (12/13, p=1.0) and 64.9% (24/37, p=0.446) for SWV2. With this method of quantitative elastography, the elasticity measurements of the lesion and its surrounding tissue helped in breast lesion characterization together with B-mode ultrasound. 3. Diagnostic Value of Virtual Touch Tissue Quantification for Breast Lesions with Different Size. Minghua Yao Jian Wu, Liling Zou, Guang Xu, Juan Xie, Rong Wu, and Huixiong Xu. BioMed Research International Volume 2014, Article ID 142504.